During a relatively short late 19th century playing career, Tommy McCarthy forged a reputation as an inventive baseball strategist, a fine defensive outfielder, and a good, if not exceptional, batsman. A significant member of pennant winners in both the American Association and the National League, McCarthy lingered in memory as the lesser half of the Boston Beaneaters’ celebrated “Heavenly Twins” outfield of the early 1890s. Fifty years after his major-league days were over, McCarthy joined fellow Twin Hugh Duffy in the Hall of Fame as a member of the ten-man class selected by the Veterans Committee in 1946. Since that time, McCarthy’s induction has served as a paradigm for Cooperstown critics, often cited as the foremost example of dilution by the Veterans Committee of the standards for baseball immortality. The subject of this critical commentary was born Thomas Francis Michael McCarthy in Boston on July 24, 1863, the eldest of seven surviving children born to Irish immigrant laborer Daniel McCarthy and his wife, Sarah, nee Healy. Young Tommy grew up in the Celtic enclave of South Boston, beginning his working life in a local clothing factory while still in grade school. His spare time was spent playing baseball on Boston sandlots. After graduation from John A. Andrews Grammar School, McCarthy found work in local piano assembly plants and attracted attention pitching after-hours for company league teams. In 1884 he was given a tryout by Tim Murnane, later a famed sportswriter but then player-manager of the Boston entry in the fledgling Union Association. 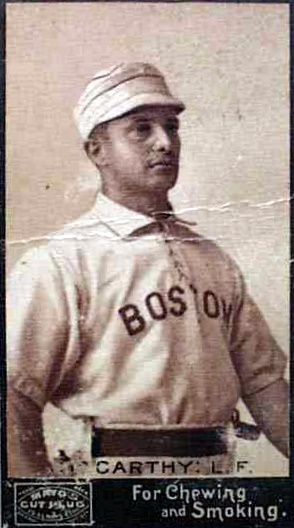 Although signed by the Boston Reds as a right-handed pitcher, Tommy made his professional debut as a right fielder, going hitless in a July 10 game against Chicago’s Hugh Daily. For the remainder of the season, McCarthy alternated between the outfield and the mound, pitching well against local semipro competition in exhibition games but without success in Union Association play, going 0-7 with a 4.82 ERA. Nor did the right-handed batter impress with the stick, hitting only .215 with little power in over 200 plate appearances. After the one-season Union Association folded, McCarthy was signed as an outfielder by the National League Boston Beaneaters. But again he failed to hit, drawing his release in August after posting a paltry .185 batting average in limited action. He finished 1885 playing for Haverhill in the Eastern New England League under manager Frank Selee, a pilot who would become a recurring presence during McCarthy’s career. Tommy began the following season on the Haverhill roster, but after seven games his contract was purchased by Providence, only recently the National League champion but now demoted to the Eastern League. He batted .281 in 20 games for Providence before the franchise collapsed in June. The next stop on the 1886 McCarthy odyssey was Brockton of the New England League, where a capable .327 batting average in 76 games caught the eye of Harry Wright, then leading the Philadelphia team in the National League. Once acquired by the Phillies, however, McCarthy saw action in only eight games, hitting .182 in 27 at-bats. The start of the 1887 season brought more of the same. McCarthy received little playing time in Philadelphia and was unproductive – a .186 batting average in 70 plate trips – when he was in the lineup. By June Tommy was back in the minors, sold to Oshkosh of the Northwestern League for $800. There he finally blossomed as a ballplayer. Reunited with manager Frank Selee, Mac tore up the circuit. In 80 games he hit .389 for Oshkosh, with 102 runs scored and 69 stolen bases. Aside from the patient tutelage of Selee, McCarthy may also have benefited from the company of his wife during his stay in the Northwestern League. Like Tommy, the former Margaret McCluskey had been born in Boston of Irish Catholic immigrant parents. But little else is known of Margaret, including the date of her marriage to McCarthy. At the time, however, she was probably about 20 years old and already carrying the couple’s first child, a daughter named Sarah (Sadie), born in Boston in January 1888. McCarthy’s sensational half-season in Oshkosh put him back on the path to the majors. When Oshkosh disbanded after its pennant-winning 1887 season, Tommy signed with the St. Louis Whites of the newly organized Western Association. Once there, standout play in an 1888 preseason exhibition series with the St. Louis Browns of the American Association prompted Browns player-manager Charles Comiskey to purchase McCarthy’s contract and slate him for the team’s vacant right-field post. At 24, Tommy McCarthy was about to embark on the nine-year major-league run that would ultimately land him a place in Cooperstown. Despite the loss of stalwarts Bob Caruthers, Curt Welch, Dave Foutz, and Bill Gleason from an 1887 postseason championship team, the Browns were still a formidable lot. In addition to slick-fielding first baseman Comiskey, the squad boasted American Association batting titlist Tip O’Neill, feisty third baseman Arlie Latham, and 32-game winner Silver King. During the 1888 season, the unproven new right fielder contributed more than his share to the Browns fourth straight American Association crown, hitting a solid .274, with 107 runs scored. And the fielding and baserunning attributes that would win McCarthy lasting fame were also on early display. With the strong, accurate throwing arm that befitted a former pitcher, Tommy registered 42 assists from his outfield post. The speedy McCarthy was also a force on the basepaths, credited with a career-high 93 stolen bases, fourth best in the Association. McCarthy continued his first-rate play in the postseason, but the Browns failed in their title defense, dropping a ten-game match to the National League champion New York Giants. Still, Tommy paced his mates with a team-high ten runs scored in a losing cause. McCarthy solidified his hold on the Browns’ right-field job with an excellent sophomore season. He upped his batting average to .291, while leading the American Association in plate appearances (656) and official at-bats (604). He scored 136 runs, stole 57 bases, and chalked up 38 more assists from his outfield post. Despite the meddling of bumptious team owner Chris von der Ahe, the Browns recorded an outstanding 90-45 log for the 1889 campaign. But Brooklyn, paced by Browns expatriates Caruthers (40 wins) and Foutz (113 RBIs), edged St. Louis by two games for the league crown. The 1889 season had been played amid rising player discontent with the teams’ management practices. Simmering resentment about the reserve clause and other restraints on player freedom of movement had been exacerbated by the adoption of a miserly salary classification scheme by National League team owners that year. Revolt came under the direction of John Montgomery Ward, the visionary star shortstop of the Giants, whose efforts led to the formation of the Players League. Although Ward and his agents focused – with great success – on inducing National League stars to join the new league, the American Association was not immune to player defections. And the Browns were particularly hard hit by jumping players. Abandoning St. Louis were Comiskey, O’Neill, Latham, and King, the very heart of the Browns team. Given his 1889 performance, Tommy McCarthy would have seemed a likely target of Players League recruiters as well. But Mac had already signed with the Browns for the 1890 season by the time the new league began its player raids, and he would remain true to St. Louis. That loyalty was rewarded by Browns owner Chris von der Ahe, who appointed the now 26-year-old outfielder his new player-manager for the coming pennant chase. In short order, McCarthy would come to rue his boss’s favor. With only remnants of the Browns championship array still in uniform, McCarthy’s team got off to an indifferent 11-11 start. Mediocre play on the field was aggravated by the postgame carousing of some of Mac’s charges, behavior that the new manager seemed unable to suppress. Displeased and impatient, von der Ahe summarily discharged McCarthy, replacing him with Jack Kerins and stepping off the parade of managerial changes that the mercurial team owner would inflict on the Browns that season. To his credit, McCarthy did not let his travails as the Browns’ field leader affect his play. Against the watered-down American Association competition of 1890, Tommy had a breakout season, batting a career high .350 with 43 extra-base hits. He paced the league in plate appearances (625) and stolen bases (83), while ranking in the top five in runs (137), hits (192), home runs (6), on-base percentage (.430), and slugging average (.467). McCarthy also demonstrated his versatility, playing 33 games in the Browns infield. The collapse of the Players League at season’s end brought Comiskey back to St. Louis, where he reassumed the Browns’ helm. And the return of Tip O’Neill and the arrival of Dummy Hoy placed Tommy McCarthy back in a first-class outfield. Mac was a major contributor to the Browns’ strong second-place finish in 1891, filling in capably at second base, shortstop, and third base when not playing a sterling (29 assists) right field. He had a fine season offensively as well, batting .309 with 92 RBIs and 124 runs scored. McCarthy’s power statstics and stolen-base (37) totals were down from the previous year but his ability to make contact with the bat was remarkable. In 629 plate appearances (570 at-bats), he stuck out only 19 times. The 1891 season brought to a close the ten-year existence of the American Association as a major league. The Association’s demise precipitated expansion of the National League to a 12-club circuit and a scramble to sign available American Association players. McCarthy availed himself of the opportunity to return home, joining the Boston Beaneaters. The move united him once again with mentor Frank Selee and made Tommy a teammate of the player who would become his fellow Heavenly Twin, business partner, and lifelong friend: Hugh Duffy. The two were remarkably similar – New England-born Irish Catholics of small physical stature (McCarthy: 5-feet-7, 170 pounds, Duffy: 5-feet-7, 168 pounds) and feisty temperament (although Duffy was a far more virulent umpire baiter than Mac). Both were outstanding defensive outfielders who had the dexterity to play infield positions competently when called upon. Each man was swift afoot, with McCarthy being the more prolific basestealer while Duffy, a right-handed batter like Mac, was the decidedly better hitter of the two. Perhaps most important, both McCarthy and Duffy were aggressive and intelligent baseball men, devising or refining the diamond strategies that were the hallmark of major-league play in the 1890s. No less astute an observer than John Montgomery Ward credited McCarthy with the invention of the hit-and-run play, used to great advantage with Duffy batting behind him. Mac was also an early exponent of the outfield trap, employing that maneuver as well as the feigned misplay to throw out many an unwary baserunner. In addition, he was an expert stealer of opponents’ signs. The duo that would soon be dubbed Boston’s Heavenly Twins did not make an overwhelming first impression on Beaneaters fans. In their inaugural season together, both registered undistinguished marks at the plate, Duffy hitting a subpar (for him) .301 while McCarthy’s average sank to .242. Key to the pennant captured by the 1892 Boston team was the stellar pitching of Kid Nichols and former Brown Jack Stivetts, each of whom posted a 35-16 log, and the adroit managing of Frank Selee. The Duffy and McCarthy bats would awaken, however, in the postseason. Hugh (.462) and Mac (.381) charged the offense that carried the Beaneaters to a sweep of the second-half split-season champion Cleveland Spiders in a playoff match that attracted little fan interest. The pair’s postseason heroics were a taste of things to come. The 1893 season found Duffy and McCarthy on batting rampages – doubtless fueled to some measure by the elongation of the pitching distance to the present 60 feet 6 inches and the elimination of the pitcher’s box. Duffy hit a league-leading .363 and ranked among the league’s leaders in runs, hits, and RBIs. Although limited by injuries to 116 games, Mac provided yeoman support: a .346 batting average, with 107 runs scored, 118 RBIs, and 46 stolen bases. With McCarthy now flanking center fielder Duffy on the left rather than in right field and both men given to playing shallow, the pair continued the crafty outfield tactics that raised havoc with enemy baserunners. Abetted by the strong work of teammates Herman Long, Billy Nash, Bobby Lowe, and Tommy Tucker, and with excellent pitching by Nichols, Stivetts, and Harry Staley, the Heavenly Twins paced the Beaneaters to the 1893 pennant, captured by five games over runner-up Pittsburgh. But without a viable formula, no postseason championship play was attempted that year. At the close of the 1893 season, McCarthy and Duffy joined forces off the field as well, becoming co-proprietors of a Boston bowling alley/saloon. A convivial man not averse to having a drink, McCarthy enjoyed bending an elbow with the Beaneaters fans who patronized the establishment. But the venture did little to enhance his baseball skills and initiated the weight gain that would plague him for the remainder of his playing career, and life thereafter. But no diminution in McCarthy’s abilities was immediately detectible. The 1894 season found the Heavenly Twins at the zenith of their on-field performance and public acclaim. In a year where a .310 batting average was the league norm, Hugh Duffy hit a major-league all-time high .440, while leading the National League in hits, doubles, homers, and total bases. He scored 160 runs and drove in 145. While not comparable to Duffy’s performance, McCarthy posted more than respectable offensive numbers himself, hitting .349, with career highs in home runs (13) and RBIs (126). He scored 118 runs and stole 43 bases. But the offensive exploits of the Heavenly Twins was not enough to carry Boston to a third straight National League pennant. Rather, the Beaneaters fell to third place, eight games behind the tempestuous Baltimore Orioles of McGraw/Keeler/Jennings/Kelley/Robinson fame. Although he was only 30 years old, McCarthy’s best playing days were already behind him. The 1895 season proved an unhappy one for Mac and the Boston club, which plummeted to sixth place. Out of shape and often in foul temper, McCarthy hit a mediocre .290 with only 17 extra-base hits. The former American Association base-stealing champ was also sluggish afoot, stealing only 18 sacks, while often playing a lackadaisical left field. Worse yet was McCarthy’s behavior outside the lines. On various occasions he voiced unseemly public criticism of manager Selee and team captain Nash. He also engaged Jack Stivetts in an ugly off-field confrontation. In a relatively brief period McCarthy wore out his welcome with the Beaneaters and he was placed on the trading block at season’s end. His business partnership with Hugh Duffy was also drawing to a close. In November 1895 Duffy relinquished his interest in the Duffy & McCarthy establishment (but the two would continue their friendship). In the meantime Boston sold its contract for McCarthy’s services to Brooklyn for $6,000. After holding out in the spring of 1896, McCarthy reported to the Bridegrooms in poor physical condition, made little effort to get in shape thereafter, and proved a disappointment to Brooklyn. A lack of hustle in the field and on the bases was periodically noted in press coverage of McCarthy’s play and he underperformed with the bat as well, hitting only .249 with but 15 extra-base knocks. All in all, Mac’s 1896 performance was roughly comparable to the dismal ninth-place finish of the Brooklyn team as a whole. The dissatisfaction of team management was reflected in the salary slash contained in the 1897 season contract sent to Tommy. Then, tragedy struck the McCarthy family. On February 26, 1897, Margaret McCarthy died of pneumonia, leaving Tommy alone to raise their three young daughters. McCarthy thereupon rejected the Brooklyn contract, electing to remain in Boston. For the next 15 years, he supported his family primarily with the income produced by his saloon. Although his major-league career was now over, Tommy McCarthy did not sever the connection with baseball. He stayed involved in the game for the remainder of his life. In early 1899 Mac succeeded Jesse Burkett as coach of the Holy Cross College nine, guiding the team to a 19-5 record that season. The following winter, he served as public representative of Boston interests in a stillborn effort to revive the American Association. Then he returned to his coaching duties at Holy Cross, with his team posting a 19-6-1 log in 1901. After a three-year hiatus, McCarthy resumed his coaching duties in 1904-1905, the latter Crusaders team featuring future major-league standouts Bill Carrigan and Jack Barry. An on-field incident with an insubordinate Holy Cross pitcher named James Spring, however, prompted McCarthy to submit his resignation late in the 1905 season. The following spring Mac took the reins of the Dartmouth team, combining his college coaching duties with a new found passion for golf. After a successful first year at the Dartmouth helm, Tommy was approached about becoming the Boston Red Sox manager but he declined, preferring to remain in the college coaching ranks. But McCarthy would have cause to regret his return to Dartmouth. Months after the conclusion of the 1907 season, the college administration publicly faulted his failure to curb his players’ appetite for summer pro ball and unceremoniously dismissed him from his coaching post. Thereafter, Tommy began a varied scouting career, initially bird-dogging prospects for the Cincinnati Reds from 1909 to 1912. He sold his Boston tavern the following year and soon took up scouting for the Boston Braves. While still working for the Braves, Mac put in a final spring as coach of the Holy Cross team. The Crusaders’ 10-8 record for 1916 closed the McCarthy college coaching log at a commendable 107-53-3 over seven campaigns. In 1918 he took his lone fling at managing a professional team, piloting the Newark Bears to a 64-63 fourth-place finish in the Eastern League. Midway through that season, the now 55-year-old McCarthy succumbed to the urge to insert himself into the action. In his final professional at bat, Newark pinch hitter Tommy McCarthy rapped a sharp single – only to be thrown out trying for second. Mac took up scouting for the Red Sox in 1920 but soon thereafter his health began to fail. He managed to fight off a case of double pneumonia during the winter of 1921-1922 but was diagnosed with cancer a few months later. He felt well enough to do a little scouting in the spring of 1922 but was thereafter confined to his bed. As word of his condition spread, arrangements were made for the playing of a Tommy McCarthy all-star benefit game in Fenway Park. Sadly, Mac did not live to see it. He died of stomach carcinoma at his Dorchester home on August 5, 1922, aged 59. A stricken Duffy was among the pallbearers delivering the deceased to Old Calvary Cemetery in nearby Roslindale, where Mac was laid to rest next to his wife. He was survived by daughters Sarah, Edith, and Margaret (Rita). After the funeral service, Hugh Duffy remembered his old outfield companion fondly, telling assembled reporters that Mac was “always a quick thinker, full of nerve and fast, with a wonderful arm. … I have never seen anyone who could think or act as quick as he could.” But from there, the memory of Tommy McCarthy receded as baseball entered the Age of Ruth and embraced an entirely different way of playing ball. It was, therefore, largely unexpected when the Veterans Committee included McCarthy among those enshrined in the Cooperstown Class of 1946, an honor bestowed some 50 years after Mac had played his final major-league game. By Hall of Fame standards, Tommy McCarthy’s measurable accomplishments, apart from steals (468) and outfield assists (266), are exceedingly modest: 1,273 major-league games played, 1,493 hits, 732 RBIs, and a lifetime .292 batting average. This has made the McCarthy selection a prime complaint of Veterans Committee critics. But as baseball scholar/author David Fleitz has observed, McCarthy was inducted “not for his statistical achievements but for his contributions to baseball strategy” and their impact on the game. And it is on that basis that the likeness of Tommy McCarthy graces the walls at Cooperstown, his memory forever preserved with that of Ruth, Cobb, Jackie Robinson, and the other immortals. The primary source for the biographical details of this profile is Hubbard, D., The Heavenly Twins of Boston Baseball: A Dual Biography of Hugh Duffy and Tommy McCarthy, McFarland & Company, Inc., Jefferson, North Carolina, 2008. Hubbard gives Tommy’s mother the first name Rose, without maiden name. The identification of Mrs. McCarthy as the former Sarah Healy is based on death-certificate information supplied to the registrar by Tommy’s daughter Sarah (Sadie). A copy of the Tommy McCarthy death certificate was obtained by the writer from the Giammati Research Center at the Baseball Hall of Fame, Cooperstown, New York, and its designation of Sarah Healy as the name of McCarthy’s mother is adopted by the McCarthy entry in the Biographical Dictionary of American Sports: Baseball, Porter, D., compiler, rev. ed., 1995. An improbable coincidence arises if Sarah Healy was, in fact, the maiden name of Tommy McCarthy’s mother. For the mother of McCarthy contemporary and fellow Hall of Famer George Davis was born Sarah Healy as well. Unlike Mrs. McCarthy, however, Sarah Healy Davis was born in England, not Ireland, and emigrated as a child with family to Cohoes, New York, rather than Boston. Hubbard, pp. 15-19, and an unidentified news article in the Tommy McCarthy file at the Giammati Research Center. In fact, only one Boston batter managed a hit off Daily in McCarthy’s debut game. The statistical information provided herein is from http://www. Baseball-reference.com. Kerins was succeeded by Chief Roseman, Count Campau, Joe Gerhardt, and McCarthy himself, who posted a 4-1 record in a brief encore as Browns manager that season. According to James, B., The Bill James Historical Baseball Abstract, Villard Press, New York, 1986, pp. 47-48. See also the Boston Globe, August 8, 1922. The infield-fly rule was reputedly instituted in part as an antidote to this McCarthy/Duffy stratagem. See Fleitz, D., More Ghosts in the Gallery: Another Sixteen Little-Known Greats at Cooperstown, McFarland & Company, Inc., Jefferson, North Carolina, 2007, p. 63. Toward the end of his major-league career McCarthy weighed close to 200 pounds, adding the nickname Pudge to his sobriquets. In 1894 Philadelphia outfielders Ed Delahanty, Billy Hamilton, and Sam Thompson each bettered the .400 mark while part-timer Tuck Turner hit .418 in 347 at-bats. The Philadelphia team as a whole hit a torrid .350. The 1895 Boston team was wracked with dissension, much of it breaking along religious lines. Catholics McCarthy, Duffy, and Tommy Tucker were reputedly in frequent conflict with Protestant teammates like Long, Lowe, and Stivetts. Apparently the recently remarried Duffy’s second bride did not approve of the saloon’s clientele and sought to elevate Hugh’s social standing by getting him out of the tavern-keeping business. See e.g., the Brooklyn Eagle, July 11, 1896. Despite McCarthy’s retirement, Brooklyn kept him on the team’s reserved list until 1902. The Sporting News, March 3, 1917. Boston Globe, Chicago Tribune, Washington Post, November 16, 1899-February 15, 1900, passim. The attempt to resurrect the American Association is not to be confused with Ban Johnson’s efforts to elevate his American (nee Western) League to major-league status. Washington Post, Oct. 25, 1906. A natural athlete, McCarthy shot 80 in the first golf tournament he ever entered. He went on to become the inaugural president of Scarboro Golf Club in Massachusetts and remained a club member until his death. See the McCarthy obituary in the Boston Herald, August 5, 1922. The McCarthy college coaching record further breaks down to 77-36-2 in five seasons at Holy Cross and 30-17-1 in two at Dartmouth. As recorded on McCarthy’s death certificate. Post-pneumonic abscess to the lung was listed as a factor contributing to McCarthy’s passing. Biographer Hubbard suspects that McCarthy’s demise was also hastened by sustained alcohol abuse. After Margaret’s death, McCarthy never remarried. The benefit game was played shortly after Tommy’s passing, with the proceeds going to his daughters. Boston Globe, August 14-15, 1922. Quoted in the Boston Herald, August 5 1922. Critics include Bill James, James Vail, and Robert Cohen. Their critiques of the McCarthy enshrinement are excerpted in Corcoran, D., Induction Day at Cooperstown, McFarland & Company, Inc., Jefferson, North Carolina, 2009, p. 45.